The Polar Bear cooler is the cooler you keep. Built for the outdoor enthusiast, our quality product will be there for you when you need it. Nothing keeps cool like a Polar Bear! The Polar Bear will keep ice for 48 hours in 100 degree heat and will keep hot up to 200 degrees for many hours. Heavy duty luggage grade 1000 denier nylon outer shell. Specialized open cell foam air trap design. Leak proof / Sweat proof Dura-Temp liner. Heavy duty #8 weatherized rubber-coated zipper. Side release buckles, heavy duty built to last. 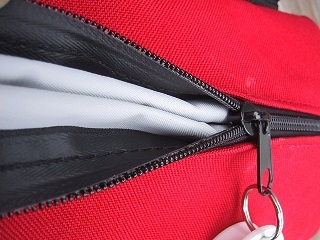 Side pocket with rubber coated zipper. Zipper pull-tab / bottle opener. Will keep ice for at least 24 hours in 100-degree heat. Camping: Polar Bear Coolers are made for camping. When selecting your camping gear, don't forget your camping cooler by Polar Bear. This product is ideal for RV camping or tailgating and storing camping food. Hunting: Polar Bear Coolers bring you the best soft-sided hunting coolers available. Boating: The Polar Bear Cooler makes a great boating accessory. This quality marine cooler is ideal for sailing as well as kayaking and canoeing. Make your Boating experience more enjoyable with quality boating and marine gear from Polar Bear Coolers. Picnic/Beach/Tailgate : Anywhere you go, Polar Bear Coolers will be there to keep your snacks, meals and favorite beverages cold.